An outstanding milestone in publishing at 6ft x 4.5ft (1.8m x 1.4m), this exquisite book is unsurpassed in size, quality, and detail. A showcase of the craftsmanship of more than 100 international cartographers, geographers and photographers. Once in a lifetime, the opportunity comes along to acquire something truly exquisite and unique—a piece of history, a rare collectible, a masterpiece... EARTH Platinum Edition is such an acquisition. 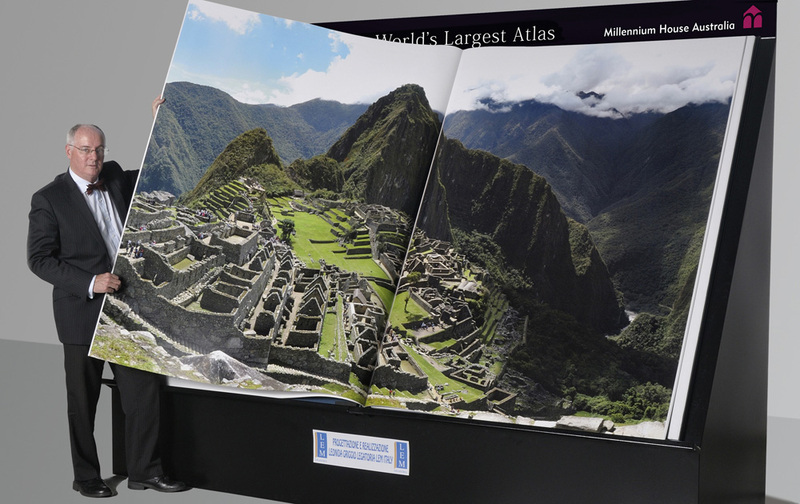 With only 31 individually numbered copies of this immense, limited edition atlas available, this beautifully presented book will be sought after by fine institutions and discerning collectors. Superb cartography is displayed on the massive pages when opened: each spread measures a breathtaking 6 feet x 9 feet (1.8m x 2.7m), presenting an unsurpassed view of the world. Every step required to produce this exclusive atlas has challenged existing processes, and the exacting standards of quality and presentation expected by Millennium House have contributed to the development of improved techniques and demanded the finest craftsmanship. EARTH Platinum Edition is destined to become a prized reference and a focal point of the world's major libraries and repositories.